Today I wanted to share with you a sewing DIY that is for a good cause! As you all know, I contribute sewing DIYs to the website Seams & Scissors. Recently they ask me if I could create an oven mitt or potholder in honor of the Love and Oven Mitts Charity Drive. Now the Love and Oven Mitts Charity Drive is about giving back by donating oven mitts or potholders to ''[...] help fill another family's kitchen with little comforts'' (source). The idea is to create an oven mitt or potholder and send it to the Love and Oven Mitts Charity Drive. All the donations for the drive, will go to the Love INC of Lake County, which helps families in Lake County, Illinois. 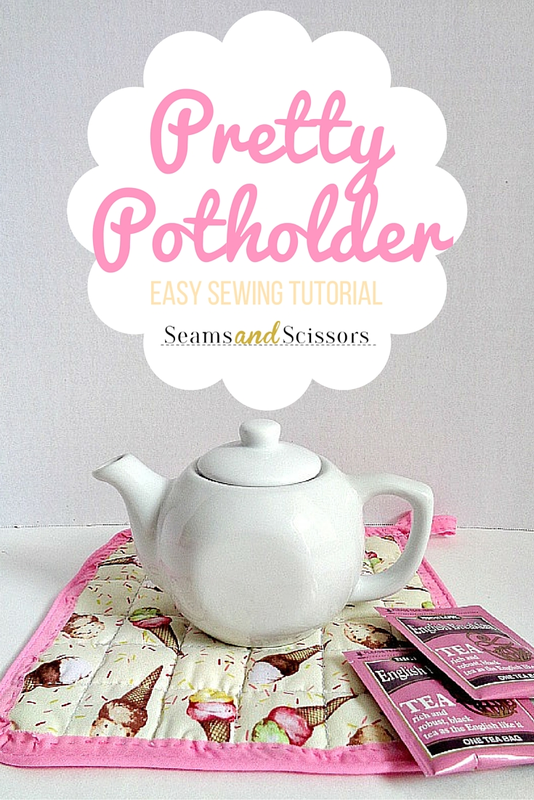 For my part in this cause, I wrote a DIY tutorial on how to make an easy potholder! Besides my project, there is another tutorial written by Carolyn (of Carolyn's Canvas), where she shows you how to make an oven mitt. So you have plenty of inspiration to get those sewing juices flowing! The charity drive is going on now through March 14. You can get all the details of where to send your oven mitts or potholders to, by clicking this link! So what are you waiting for? Go get some fabric, break out that sewing machine and make an oven mitt or potholder for someone in need!